Two-player heads-up limit Texas hold'em poker weakly solved by AI researchers at University of Alberta. Now when it’s man versus machine in heads-up limit hold ’em, the machine will win. The researchers say that the algorithm has “weakly solved” the game—it can’t win every hand, but over a large number of hands it will either break even or come out ahead. 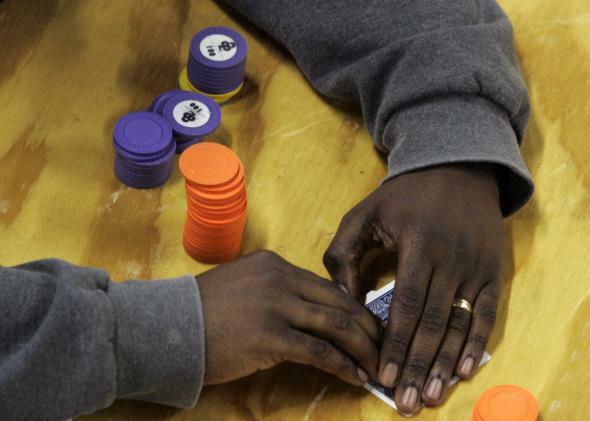 In heads-up limit, players can only bet set amounts of money at particular times. This version of the game is less popular—and less complex from an experimental perspective—than heads-up no-limit, which allows players to bet as much of their money as they want. Heads-up games are always between only two players. Adding more players would make the scenario significantly more difficult to parse. If you think you’re a pretty good poker player, you can try competing against the algorithm, known as Cepheus. Your confidence will be shattered pretty quickly. It’s awesome. Solving the game isn’t just about creating robotic dogs that can all sit around a table and play perfect poker, though. “We are a computer poker research group, but we exist because we’re really interested in advancing artificial intelligence techniques,” said group lead Michael Bowling. Togelius notes that games are valuable for AI research because they can be iterative for testing. This is related to the idea that algorithms can’t function if they face overwhelming uncertainty. “It’s easy to make many variations of a game, which is important in order to test AI properly: To be generally intelligent, you must be good at not only one task, but many tasks,” Togelius said. The goal of the hold ’em research is to use poker puzzles as experimental stand-ins for real-world problems. Bowling says the findings in this new research are especially valuable because they give us a hint at the scale of problems AI can solve. Algorithms are already used to optimize solutions in numerous areas, like elevator control and security (for example, air marshal scheduling and coast guard patrolling). But the bigger a problem gets, the less certain people are that they can trust it to an algorithm. Solving a game as complex as heads-up limit Texas hold ’em could mean a breakthrough in our conception of how big is too big. “With our results we’ve been able to show that we can solve … enormous problems on a much larger scale than has been done before,” Bowling said. For example, problems involving vast transportations systems—take a network of airport checkpoints—seem increasingly applicable to new AI methods. OK, so is it time to turn all of our decisions over to computers yet? Bowling says that that process will continue incrementally, the way it has for decades. And there are still significant limits on what AI can achieve. By and large, AI still can’t generalize across things it has learned to extrapolate theories about new uncertainties. “An excellent heads-up limit player can walk into heads-up no-limit and they don’t start from scratch,” Bowling says. “Whereas if we were to try to take our program, which plays heads-up limit at a near-perfect level, and play heads-up no-limit, it couldn’t.” But this is the type of problem that Bowling plans to work on with his group in future research. Hopefully he’s not bluffing about that.